Batukamma starts on 14th October 2012 and ends on 22nd October. Batukamma festival begins from this day. The festival is a symbol of the culture of the people of Telangana. This is also called " Saddula Batukamma". Nine days from new moon flower fragrance, songs, games village will glows. The poor, the rich, without distinction of women in all areas of the festival is celebrated according to their status. Ladies will sing songs to ensure their Magalasutra for more years. Ladies will wear Colourful Saris, jewellery and beautifully decorated, they will all meet in a place and celebrates collectively to view the festivities will be the most fanfare. 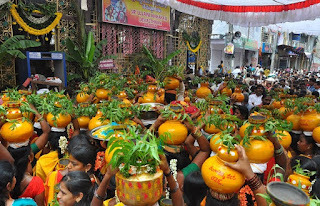 That this festival was actually the name of protecting their Magalasutra which is actually Mangala Gowri Vrata. This is also called Mahalaya amavasya. This is is celebrated for forefathers (pirtulu), so it is also called pitalla amavasya. This will be occurred once per a year, this month from Trayodasi to Amavasya. This means that it is believed to be the ancestors of darkness.